In 5 months of traveling around Bali we've had some of the best experiences in our lives, but we've also had dozens of mistakes, injuries, and blunders. Getting Bali Belly, Dengue fever, bee stings and a traffic ticket. Running out of gas and burning our legs on the exhaust of our scooter. Waking up at 4 AM and still missing sunrise by 5 minutes. No matter how much you prepare and how careful you are, you can never be fully prepared for the challenges that traveling may throw at you. All you can do is try to learn from your mistakes and laugh at yourself once it's no longer too soon. 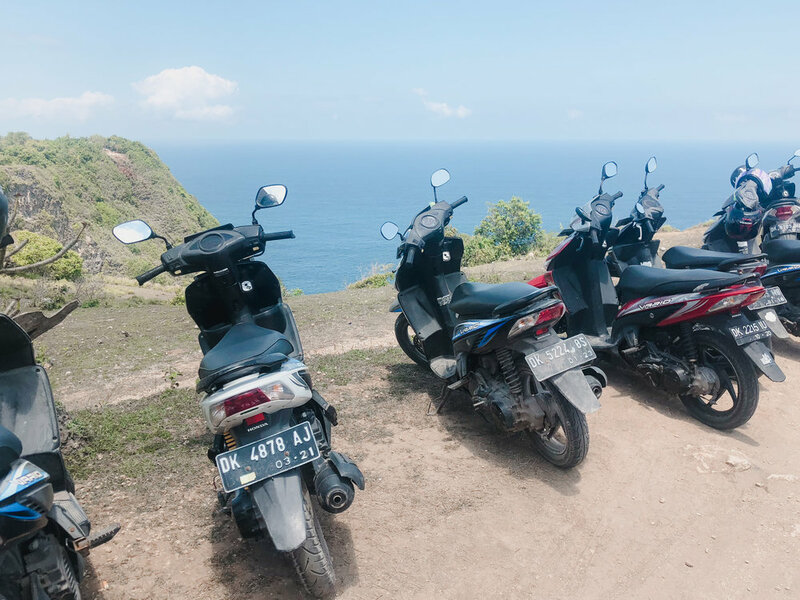 That's why we've compiled this list of our top 5 travel fails in Bali! We were riding on our scooter, taking our usual route to Indonesian class. Suddenly, two animals sprinted out into the street. We braked suddenly but felt a bump followed by a yelping sound. A small dog had been chasing a cat into the street. While we braked as soon as we could, the front wheel of our scooter ran entirely over the dog. The dog was crying and trapped between the front and back wheels of the scooter. We lifted the scooter up and it ran back to its owner, crying. While the owner frantically examined her dog, her second, much larger dog ran out and started angrily barking at us as if it were saying "Why would you do that to my friend!" We felt so horrible and concerned but the owner said it would be ok and to continue on. For the next three weeks, we checked that same corner each time we passed it on our route to Indonesian class. There were days when we saw the owner and her larger dog but the little dog was nowhere to be seen. We were convinced that it had died from internal injuries. Finally one day, there it was, sitting in a little chair, looking happy as could be. We then developed a second, creeping fear that it was now paralyzed but that was quickly assuaged when we saw it in happily running around the following day as if nothing had happened. After spending the entire morning at Nungnung waterfall, we were about to leave when we decided to fly our drone. So we unpacked our 2 month old, sparkling new DJI Spark and started flying it around the waterfall. The drone was acting oddly and floating in random directions even without us controlling it. Once we regained control of the drone, we decided to get one more shot of the waterfall. We looked up to the sky, but the drone was very high up and difficult to see. We looked back down at the remote and to our horror, the drone crashed itself into a bush. All we could see from the camera view was a tangle of twigs and leaves. After two hours of searching the dense and muddy foliage surrounding the waterfall, we left empty handed. After the crash, we learned a few things. Our drone didn't have GPS signal when it took off and we later discovered that the drone is unable to hover in place without GPS. We also later discovered the features of being able to play a sound and see your drone's location on the map. It's likely we still wouldn't have been able to find our drone even with these features, but it couldn't have hurt. The moral of the story is to make sure you know your equipment really well! Having travel insurance was also a lifesaver as we were able to replace the drone for free rather than losing $600! To be honest, Alex had this one coming. It was our second visit to the Ubud Monkey Forest and we were less cautious than the first visit. All over the forest, there are cages full of cut up potatoes meant for the monkeys to feed themselves with. Alex wanted to see if he could bait the monkeys with these potatoes. He grabbed one and held it out towards a monkey, who cutely scurried over and grabbed it. After that, he was hooked, grabbing potatoes and getting monkeys to climb on him in exchange for potatoes. He held one potato by his ear and a monkey hopped on his shoulder and tried to grab it. Alex, wanting a cute photo for his Instagram, didn't let go. The frustrated monkey lightly bit Alex's ear and finger so that he would release the potato. While the bite wasn't that hard, Alex previously had a scab on his finger which reopened and was now bleeding. Interacting with the monkeys was fun but the subsequent three hospital visits for rabies shots were not. We had 4 friends visiting, and in spite of them being new to scootering, we suggested that it would be more fun and convenient to scooter around Ubud. After day 1 went by smoothly, we made plans to do the 25 minute scooter ride from Ubud to see the rice fields the following morning. The first incident happened on the way to the rice fields. Alex and I were leading the way but forgot where the turn to the parking lot was and made a sudden left turn when we saw it. In an attempt to make the last minute turn, one of our friends turned sharply and his scooter spun out underneath him. He had bad road rash on his arm but was otherwise fine! Everyone was a little shaken but overall ok. The second incident happened after we were leaving the rice fields. We all hopped on our scooters and were exiting the parking lot. There was an unreasonably high curb that you had to get over to get out. So one of our friends pulled the throttle of her scooter to help it get over the hump. Suddenly her scooter made it over the curb and rapidly accelerated straight into a concrete wall. Her knee was spewing blood but with the help of a local we managed to get her to a hospital in Ubud where she ended up with 9 stitches. We couldn't help but feel responsible for the accidents but our friends were such great sports and managed to have an amazing rest of their trip nonetheless. We just finished lounging in Angel's Billabong in Nusa Penida. It was 5:15pm and we wanted to make it to Crystal Bay in time for sunset which would be at approximately 6:15pm. The Google Maps directions suggested an extremely roundabout 17.6km route that would take exactly an hour. Wanting to save some time, we found a 5.7 km shortcut under the walking directions. We thought our shortcut would take 20 minutes maximum on our scooter. 10 minutes later and we were already halfway through. We took a left turn off the main road, following a narrow path running through the forest. The 3 foot wide path became more and more treacherous. Our poor little scooter was struggling to make it up a steep, gravely incline when it suddenly ran out of gas. Since our scooter didn't have a working gas gauge, we didn't see this coming. We shamefully pushed our scooter up and down this desolate path until 30 minutes later, we finally arrived at Crystal Bay. We were exhausted and sweaty but in the end we made it in time for the most beautiful sunset! What's the biggest mistake you've made while traveling? Let us know in the comments!